UK Hallmarking How Does it Work? The history of hallmarking in the UK dates back to 1300 when Edward I instituted the assaying (testing) and marking of precious metals. The original aim of the system remains unchanged; the protection of the public against fraud and of the trader against unfair competition. Indeed, hallmarking is one of the oldest forms of consumer protection. On the internet many traders (even some large companies – see EBay and Amazon item descriptions when you enter “Hallmarked”!) will say that an item is hallmarked when all it has is a 925 stamp. A 925 stamp means nothing at all (you can buy 925 stamps from Ebay!) and to have items passed off as having a hallmark this way is very irritating for silversmiths such as myself because by law in the UK every items that has more than 7.76g of silver in it MUST be assayed. The costs of this depends on how many items you can get assayed at once. For large scale manufacturers the costs are around £1 per item but for makers of one off items a minimum charge policy applies which means with postage it can cost around £40 to get a single item hallmarked. Out of interest I did a test purchase of some silver items from E-bay a couple of years ago, they were a mixture of bracelets and chains all said to be silver and all stamped 925. They all came from a highly rated seller in China and all five of them turned out to be silver plated – so please beware! Remember a 925 stamp on its own means nothing, nor does the statement that an item is silver. I reported the problems to E-Bay and the trader refunded my money but he is still trading on there. 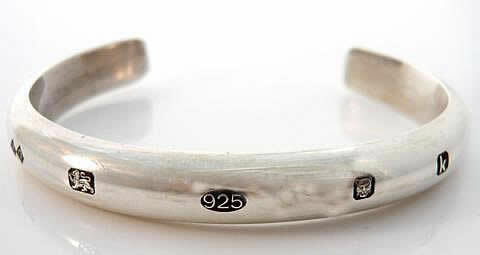 A traditional hallmark has four elements, the makers mark (mine is HQ in two diamond shapes) , the standard mark such as 925 for sterling silver,the assay office mark (leopard for London for example) and an optional (nowadays) date mark which is a letter showing when the item was made. Protect yourself when buying silver and don’t get ripped off – it isn’t a bargain if it isn’t really silver, make sure your items over 7.76g have a real UK hallmark.